ROACH, William Nathaniel, a Senator from North Dakota; born in Washington, D.C., September 25, 1840; attended the public schools, Gonzaga College, and Georgetown University, Washington, D.C.; clerk in the quartermasters department during the Civil War; moved to Dakota Territory in 1879 and settled in Larimore; interested in mail contracts for several years; member, Territorial house of representatives 1885; unsuccessful Democratic candidate for governor at the first State election in 1889 and again in 1891; elected as a Democrat to the United States Senate and served from March 4, 1893, to March 3, 1899; unsuccessful candidate for reelection; discontinued active business pursuits and lived in retirement in Washington, D.C.; died in New York City on September 7, 1902; interment in the Congressional Cemetery, Washington, D.C.
Schlup, Leonard. 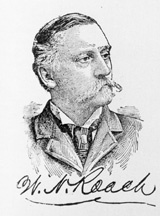 William N. Roach: North Dakota Isolationist and Gilded Age Senator." North Dakota History 57 (Fall 1990): 2-11.